SP's Activation Tactic of the Week Series is supported by social media solutions provider, KickApps. Create Custom Widgets, Grow & Engage Your Audience. Free Sign Up! Time was when bloggers had to party crash media's elite events, but some lucky Big East alums officially arrived this week, with a personal invite to Media Day and the backing of a major sponsor to boot. Working with PR and social media agency, The Cake Group, Volvo engaged independent Big East bloggers from 15 member schools and sent them to Media Day at Madison Square Garden, courtesy of the Swedish automaker. 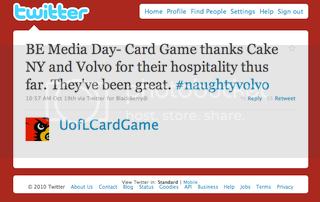 The blogging partnership is aimed at helping promote the new Volvo S60 (being dubbed the Naughty Volvo). 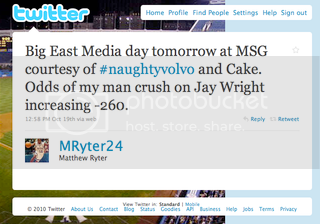 Bloggers filed blog posts from media day for each of their respective schools and tweeted Media Day updates under the hashtag #naughtyvolvo. Finally, Volvo and The Cake Group have launched MyBigEastVolvo.com, which will tie together all of the Volvo-sponsored editorial from each campus. MyBigEastVolvo asks fans to "follow along while your favorite school's alum documents a once-in-a-lifetime trip with the Volvo S60 back to campus to catch a regular season basketball game & competes to become the "Biggest Fan of the BIG EAST." In a deal negotiated by the conference's sales partner, ISP Sports (recently acquired by IMG), and announced prior to media day, Volvo became the official vehicle of the Big East. If you've seen a great activation tactic we should showcase, let us know about it by emailing tips@sponsorpitch.com.